I'm travelling overseas in a few days and when I was doing some travel item shopping at my local drugstore (Priceline for all you Aussies), I came across this palette by Savvy by DB. It was only about $5 AUD and seemed like it had a good assortment of neutrals so I picked it up. I justified this unecessary purchase of yet more eyeshadow by convincing myself it was a good palette for travelling as I wouldn't care if I lost it or broke it in transit. It comes in black plastic packaging which, though not the prettiest packaging, doesn't scream cheap like some other palettes I've seen. It comes with the typical cheapo sponge tip applicator which I really wish brands would just ditch. 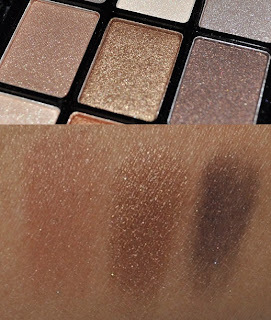 It cheapens the look of any palette it comes with and I swear no one uses them! The colours can be mixed and matched but I think there are definitely 3 distinct groupings happening in each of the rows and even though it's labelled as a warm palette, it has a good mix of cool and warm toned shadows. The last shade in this first row was very sheer and almost impossible to build up. The first shade in the second row had the same problem which may have something to do with the fact that they're both in the same colour family. I also had issues with the first and last shades in the last row which applied relatively sheerly. 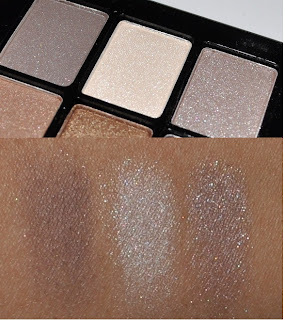 The whole palette is shimmery which is a shame as I think a good palette is one which combines both shimmery and matte shades but I guess you can't ask for much at $5. As I wasn't too impressed by the swatches, I thought I'd reserve judgment until I'd actually used the palette so I tried out a look using the colours in the third row. I managed to get an ok look out of the palette but I struggled to build the colour up in areas where the eyeshadow wasn't directly touching the primer I used underneath. I'm not planning on wearing any complicated looks while I'm overseas so I'm sure this palette will suit my needs just fine but I don't think I'd really recommend it. Maybe the colours would show up better if you're of a fairer skin tone but a palette where 3 out of the 9 shadows aren't that great is a pass in my books no matter how cheap it is unless there's a particular shade in there that you absolutely love. I haven't tried any of the other palettes and I actually love the liquid liners by this brand so I'm willing to give Savvy by DB the benefit of the doubt for now and assume that this palette isn't representative of the rest of the palettes by this brand. Have you tried this or other palette's by this brand before? Am I being too harsh and expecting too much considering the price or do you expect more regardless of how much you're paying? I've got a few of their big domed single eyeshadows and they are pretty pigmented. 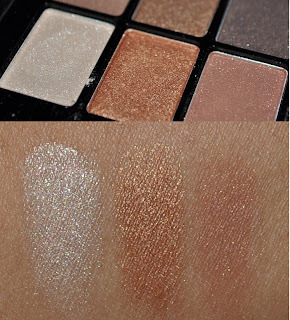 The colours are pretty as well, but I don't seem to use them all that much (probably because they get lost under all my other single eyeshadows) haha I might have to bring them out again. I always expect quality no matter what price I pay, simply because I've found products from every price range that are fantastic, and also that are epic fails. I feel that price is almost redundant when it comes to quality of the cosmetic itself.